The melting of glaciers due to global warming is expected to have disastrous consequences in the long run. The world's rapidly melting glaciers has disastrous consequences on the animals that rely on them for survival. Global warming has for long had a free reign on the planet thanks to human activities that go unchecked around the globe. The effects of these actions are never instant but when they decide to strike the results are always ugly leaving in its wake a wave of destruction and death. Global warming has hit glaciers in the Arctic and the Antarctic the hardest, and it has finally reached a point where the aftermath is starting to rear its ugly head. The rapid melting of the glaciers has the following impacts on the planet. 97% of earth's water is seawater with only 3% being freshwater which is supposed to cater to more than 7 billion people on the planet. About 75% of the freshwater is trapped in glaciers with 90% of this freshwater bearing glaciers being located in the Antarctic. With an accelerated melting rate that outstrips the replacement of the ice, more of the freshwater is lost into oceans where they mix with saline waters. The ice found on mountains and highlands which are inland sources of rivers are also receding and soon enough there will be no freshwater left for a growing human population. The accelerated melting of the glaciers produces more water that rivers could handle, this water spills out and floods areas whose streams source their waters from the glaciers. With no water harvesting plans in place, such floods end up displacing people and animals, as well as destroying farms and residential areas. Low lying areas in coastal regions around the world are already recording rising tides and seas levels as the volume of water increases. 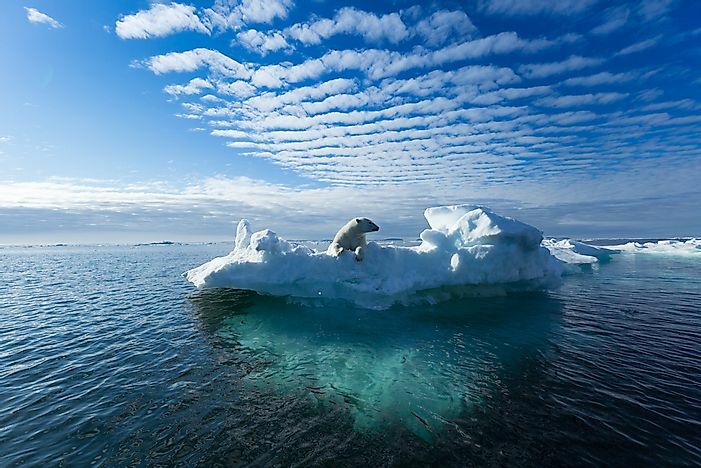 Polar bear numbers have been declining over the years due to the disappearance of ice in North and South Pole. Bears have adapted to the cold conditions of these regions, but as the climate gets warmer and the ice sheets melt away, they are left exposed to the unfamiliar environment. Evolution takes millions of years, and that is a timeframe they cannot afford. This loss of habitat has also impacted their source of food, and as a result, they are now an endangered species. Coral reefs play a critical role in the sea; they provide shelter for a quarter of all the animal species that live in the sea, regulation of oxygen and carbon dioxide, as well as protecting the shorelines. They usually grow in shallow waters in the tropics where they synthesize sunlight. With rising sea levels however coral reefs are dying out across the planet as they no longer receive sufficient sunlight and this directly affects fish populations which in turn affects the people who depend on the sea to survive. Therefore, food shortage crisis is looming ahead. Ice is a purifier, and for ages, the cold glaciers of the earth have been absorbing harmful chemicals, banned pesticides that went airborne, as well as trapping ancient viruses and bacteria which become inactive in cold conditions. As the ice continues to thaw some of these trapped viruses, bacteria, and chemicals are at risk of being released back into circulation, if this were to occur humanity could be faced with diseases that could wipe life off the earth. There is a lot of natural gas trapped under the glaciers; one such gas is methane which is not only toxic but is also a greenhouse gas. As the glaciers melt they become lighter with cracks forming. These movements create fissures through which large quantities of methane gas get released into the atmosphere further accelerating global warming by trapping heat from the surface. It is estimated that there is more than 50 gigatons of methane in the Arctic that could be released within a few years if the current pace of global warming continues unchecked. Hydro-electric power depends on rivers which get their water from highlands. These highlands and mountains have ice which melts during the warm months to produce streams which join up to form rivers which power hydro-electric turbines. As the ice disappears rivers are shrinking, and eventually they will dry up and effectively spell the end of hydro-electric power which a considerable percentage of the human population depend. With no electricity, a lot of things like industries that power most economies will come to a standstill. The weather is mainly controlled by sea currents that traverse the vast oceans. There are cold and warm currents, and each of them affects the adjacent lands. With global warming, however, all the oceans are warming up, and this is reversing the movement of currents which in the process increase storms and hurricanes in places that never used to experience such elements. Soon some deserts will start receiving snow while tropical areas will start drying up for lack of rain. This kind of phenomena will upset the balance of life on earth and lead to the extinction of sensitive species of plants and animals. Ice glaciers weigh a lot with some even being described as mini-continents. This massive weight plays an important role unknown to many. The pressure that giant icebergs exert on earth help keep in check the tectonic movements underground. As the glaciers melt rapidly, however, this pressure is reduced allowing geological process more room for reactions and movements, this gives rise to violent earthquakes that suddenly release all that trapped energy. Tsunamis and volcanic eruptions will also increase with time causing destruction and death in places that never had any history of earthquakes. Every bad thing that is happening to the ecosystem is a human handiwork, and it will only take action from humans to try to stop and reverse the effects that pollution has caused the planet. Reversing the effects of global warming is not easy but trying to make the environment healthier is better than doing nothing. Some of the steps that can help mitigate these effects include promoting recycling of waste, planting trees everywhere, using less gas, going green, eating green, cutting down on the use of cars, saving electricity and educating others on the dangers of global warming. Are Some Of The Earth's Glaciers Actually Becoming Larger?